Do We Know What the Next Incredible Hulk Movie is About? Doctor Strange might have found its leading man. We may have learned who the villains of X-Men: Days of Future Past are. All You Need is Kill gets renamed. See the new Walking Dead zombie. Learn what the music of Agents of S.H.I.E.L.D. tells us about the show. There are a million beautiful Comic-Con posters. Spoilers ahead! Composer Bear McCreary, who has composed such notable genre show themes as The Walking Dead and Battlestar Galactica, will score the pilot episode of the series, and probably be involved with the rest of the season. 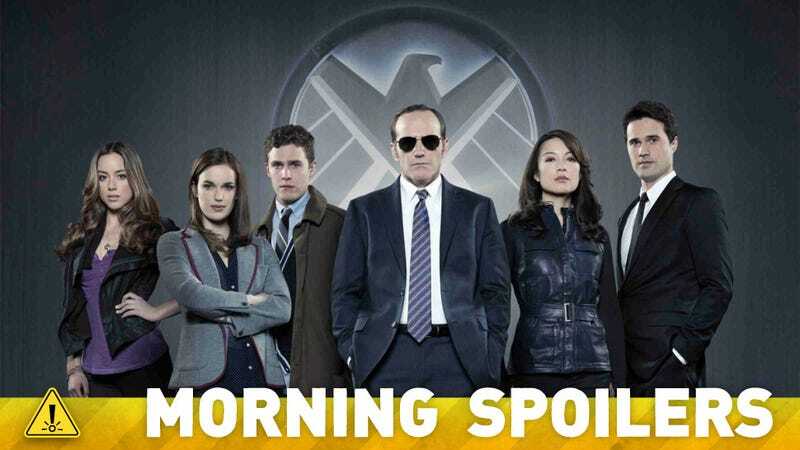 A recent interview with him gives some interesting insights into his approach to S.H.I.E.L.D., as well as some plot teasers. … Joss [Whedon] and I spoke at length about the music for S.H.I.E.L.D. in particular, about the challenge of creating a score that is big enough in its orchestral presence that it feels cinematic and feels at home in the Marvel Cinematic Universe. It also must capture the intimate human characteristics that define this series. In editorial, it became clear that simply tracking in typical big “superhero movie” music wasn’t going to work. So Joss helped guide me to find a sound that lives a little in both worlds. Kirkman: You can expect a lot of surprises. Comic book fans that think the show has steered away from the comics completely will be pleasantly surprised by Season 4. Honestly, some of the closest adaptations of the comic [that] have happened thus far is in Season 4. There are some very cool things that are told in the comics that... are adapted almost directly, which I usually frown upon. But Scott Gimple is able to talk me into things from time to time. Kirkman: There will be some things that will be directly pulled from the comics that start creeping in very early in Season 4. I think comic book fans don't know what to expect which is the best possible place to be in. Pictures have leaked online that suggest — SPOILER ALERT — Rick may lose his hand, like in the comics. What do you say to that? Kirkman: I will say Scott Gimple is a huge comic fan and may possibly be trying to steer me into letting the show be closer to what the comic books are. Also people could be misinterpreting those photos. Who knows? Gimple: I may have convinced him. Possibly. We may not know that. “The Endless Thirst” – When the town begins to run low on water, the residents of Chester’s Mill begin to fight for the remaining resources. Meanwhile, Julia discovers a strange connection that two of the town’s residents have with the Dome. HBO has officially ordered a seventh season of True Blood. Here is a teaser for the upcoming fourth season.